Bryce Harper won't be winning any Golden Gloves this year, but he won't be any worse than what the Phillies have grown accustomed to. 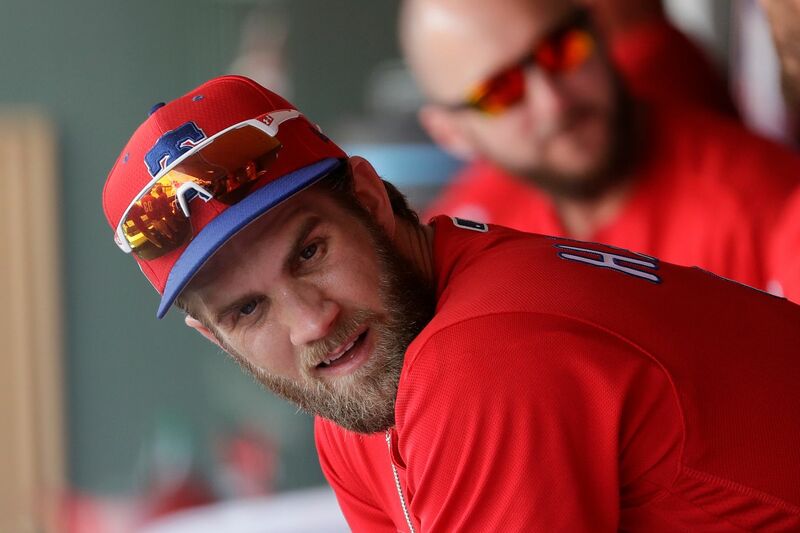 CLEARWATER, Fla. — John Middleton did not fly his private jet twice to Las Vegas because he had visions of Bryce Harper winning Gold Gloves. The Phillies did not host a news conference on top of their dugout last week with the belief they had spent $330 million on a defensive whiz. And the team’s store did not run out of a letter necessary to print Harper jerseys because the fan base was so excited with the new guy’s fielding. The Phillies were well aware of Harper’s defensive challenges when they signed him to the richest contract in the history of team sports. Most defensive metrics graded him last season as one of the worst outfielders in baseball. Harper played right field for the first four innings of Monday’s 8-2 Grapefruit League loss to Tampa Bay. He had just two balls hit to him as the Phillies received the first view of his defense. It was nice to see, manager Gabe Kapler said. Harper’s defense is a challenge the team is willing to live with because it was his bat — not his glove — that caused the Phillies to hope Harper would take their money. Harper finished last season with the lowest ultimate zone rating among all outfielders, the lowest fielding runs above average, the second-lowest defensive WAR, the second-lowest defensive runs saved, and a fielding percentage that was slightly better than the league average. Kapler said he’s “not really looking into the past” and that Harper’s work has been great so far for the Phillies. Last season was easily the worst defensive season of his career and he attributes his shortcomings to the 63 games he played in center field with the Washington Nationals. It would be great, Harper said Monday, if he can stay out of center. No need to worry, as Gabe Kapler later said Harper is the team’s right fielder. Bryce Harper blames his struggles in the field last season on having to play in center instead of in right. Harper’s struggles maximized last season, but they were not limited to just 2018. He has had a positive defensive WAR in just two of his seven seasons and has the 13th-worst ultimate zone rating among all outfielders since 2015. Phillies outfielders, in that same four-year span, had the fourth-worst UZR among all teams. Nick Williams, who Harper replaced in right field, graded just as poorly last season as Harper. Harper might not win a Gold Glove, but his defense will not be any worse than what the Phillies have grown accustomed to. Harper, in a small sample size, was not a liability on Monday. He fielded a sacrifice fly and played a double off the wall. He played with an index card in his back pocket — the card the Phillies use to position their outfielders — and said he did the same last year in Washington. Kapler said Harper’s throw to third on the sacrifice fly was "one of the better throws we’ve seen all spring.” The Phillies will do it again on Wednesday night when Harper spends a few more innings in right field. It might be a challenge, but it’s one the Phillies are prepared to face. Harper went 0-for-1 with a walk and a strikeout. ... Vince Velasquez allowed five runs on five hits in two innings in his second start of the spring. ... Jerad Eickhoff allowed a pair of homers in two innings as he saw his first action of the spring. ... The Phillies sent pitchers Austin Davis, Enyel De Los Santos, Edgar Garcia, Cole Irvin, Tyler Gilbert, and Ranger Suarez to minor-league camp. ... The Phillies are off Tuesday before playing the Yankees on Wednesday night in Tampa.